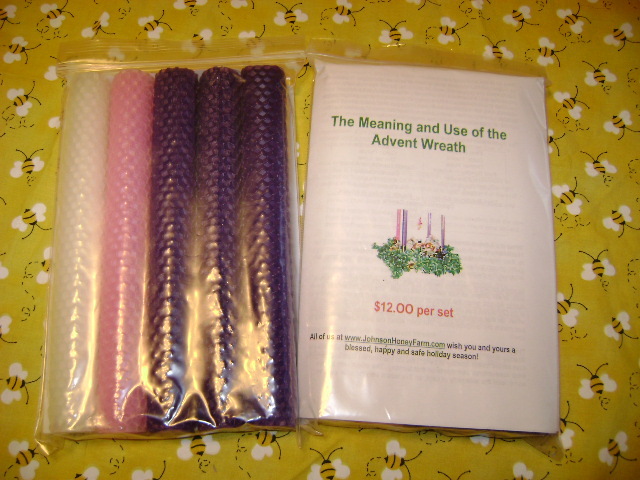 We also have beeswax candles including hand-rolled taper candles, Advent Candle Sets and molded candles. Prices vary with the product. Hand-rolled tapers - these burn smokeless and dripless and have a light, pleasant and clean smell of beeswax. They are sold in pairs and we have about 10 different colors. Use the comments section of the order form to ask what colors are available. Molded Candles - we have a variety of mold - these make really cute stocking stuffers or small add-ins for your gift boxes. Ask us about availability of shapes and pricing.